Relationships after Pons et al. 2005, Bridge et al. 2005, and Baker et al. 2007. Bridge, E. S., A. W. Jones, and A. J. Baker. 2005. A phylogenetic framework for the terns (Sternini) inferred from mtDNA sequences: Implications for taxonomy and plumage evolution. Mol. Phylogen. Evol. 37:686-699. Baker, A. J., S. L. Pereira, and T. A. Paton. 2007. Phylogenetic relationships and divergence times of Charadriiformes genera: Multigene evidence for the Cretaceous origin of at least 14 clades of shorebirds. Biol. Lett. 3:205-209. Grant, P. J. 1986. Gulls: A Guide to Identification. 2nd ed. San Diego: Academic. Olsen, K. M. and H. Larsson. 1995. 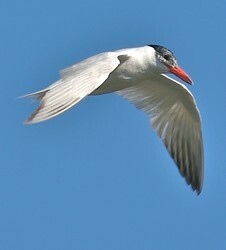 Terns of Europe and North America. Princeton, NJ: Princeton University Press. Pons, J.-M., A. Hassanin, and P.-A. Crochet. 2005. Phylogenetic relationships within the Laridae (Charadriiformes: Aves) inferred from mitochondrial markers. Mol. Phylogen. Evol. 37:686-699. 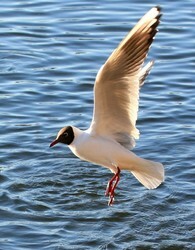 Although taken in early February (English winter) the gull is in its summer plumage. Others in its company were in winter plumage. Taking to the air from water. 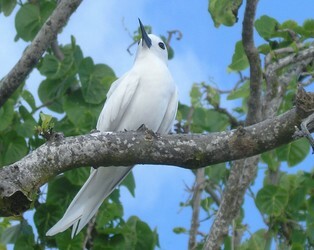 Page: Tree of Life Laridae. Gulls, Terns, Skimmers. The TEXT of this page is licensed under the Creative Commons Attribution-NonCommercial License - Version 3.0. Note that images and other media featured on this page are each governed by their own license, and they may or may not be available for reuse. Click on an image or a media link to access the media data window, which provides the relevant licensing information. For the general terms and conditions of ToL material reuse and redistribution, please see the Tree of Life Copyright Policies.